On Sunday evening, the Catalan president Carles Puigdemont was interviewed by Jordi Évole as part of a Spanish investigative journalism show called Salvados. At the end of what was often a fairly tense hour of questions about the upcoming Catalan independence referendum, the conversation shifted to football. Puigdemont, a native of Girona, appeared somewhat worn out by the final ten minutes of the interview. He laughed nervously for a few seconds, before deciding not to predict the score. “I try not to predict the future.” He said. In Catalonia right now, there are lots of people trying to predict the future. Specifically what will happen this Sunday, 1st October. Will the vote on independence take place? Will the government in Madrid forcibly stop it from taking place? And if it does take place and there is a majority for si, what then? Will there then be a new country in Europe next week? It might seem trivial to mix politics with football, but the truth is that such practice is commonplace in Spain. If you go to watch Barça play at Camp Nou, it’s hard to escape the politics. In recent years, especially in big games such as the one against Juventus a couple of weeks ago, huge banners are often displayed for the TV cameras. “Catalonia is not Spain.” “Welcome to the Republic of Catalonia.” These are the kind of messages on display. And in each half of every game, when the clock ticks past 17 minutes and 14 seconds, a cry erupts around the steep stands of the stadium calling for independence. Everywhere you look at that time there is a sea of Catalan flags. Why the 17th minute and the 14th second? 1714 was the year that Barcelona fell in the War of the Spanish Succession and Catalonia lost its autonomy. So yes – politics and football tend to go hand-in-hand in Spain. And the tension has been building. On Wednesday 20th September, the Guardia Civil arrested 12 senior Catalan Government officials and confiscated papers with a view to impede the referendum planned for this Sunday. That evening tens of thousands of people took to the streets in Barcelona to protest against the arrests. There were also official denouncements from institutions in Barcelona. Primavera Sound, the famous music festival held every year in the city in June tweeted their disapproval of the actions of the Spanish government. In an official club statement, the club said they were supporting democracy and the freedom of expression. The implication being that the Spanish government had infringed on both. Girona FC made a pretty similar statement via Twitter. The fact that Espanyol’s Twitter feed that day was focused more on commemorating their old stadium in Sarrià didn’t go unnoticed. 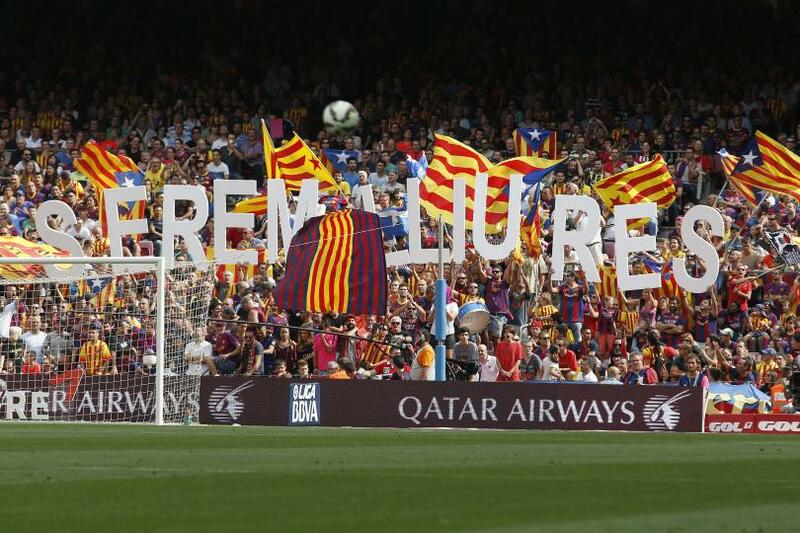 It led to familiar accusations about the club being “less Catalan” than Barça, which is a bit of a generalisation. The fact that there are now three teams in La Liga from Catalonia was something that was celebrated before the season began. Compared to the Basque Country, it has been somewhat under-represented given the influence of the region. But is there a chance that after Sunday the Catalan teams will be getting to know each other a lot more? Could it be that if Catalonia gains its independence, the Catalan teams will no longer be allowed to play in La Liga? Around the time of the last referendum (albeit a non-binding one) in Catalonia nearly three years ago, Sid Lowe wrote about the possibility of it happening for The Guardian. Not much has changed since his analysis. The league only allows for non-Spanish teams from Andorra to compete. No other state. But could that law be changed? One thing is for sure – as Lowe mentions in his piece – if there were to be repercussions after independence in terms of the Spanish teams being kicked out, the size of Barça means they would undoubtedly cope better than Espanyol or Girona. The other consideration is the amount of hostility that the Catalan teams (but mainly Barça) will receive on their travels in the wake of the referendum on Sunday. Whatever the result. The club is already often on the receiving end of hundreds of Spanish flags being waved in their direction and chants about Barcelona being part of Spain whether they like it or not. A lot of people in the rest of Spain are hurt at the Catalans attempting to leave. This was demonstrated by the people lining the streets in Andalusia to wave off policemen heading to Catalonia to try to stop the vote from taking place. Even if the vote doesn’t take place or the result isn’t for independence, the ill feeling is sure to intensify. Until Sunday, it’s hard to imagine what is going to happen. By the time Barça kick-off against Las Palmas at 4.15pm at Camp Nou, we’ll have a much better idea. At least we’ll know whether people have been allowed to vote or not. If they haven’t, then the chants for independence on the 17th minute and the 14th second are unlikely to stop.